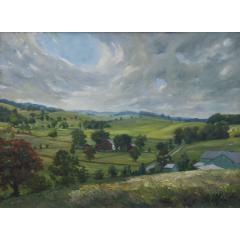 'A landscape masterfully executed elicits emotional interpretations and resonates with the observer. 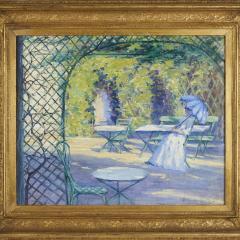 Composition and the use of light often distinguish one painting from another. 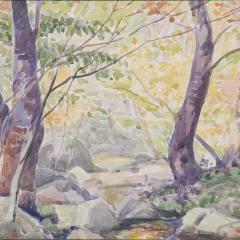 The greater the depth, treatment of light and movement in a painting, the better it often is. If you do not find a figure or portrait painting you are looking for, please call or email, we may not have cataloged it yet." 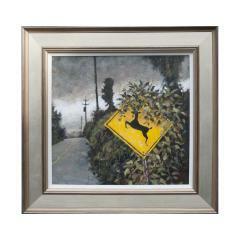 Wonderful painting showing a group of deer along the coastline of Lapland. Part of Herzogs list of 1000 painting this painting is numbered 352 verso. 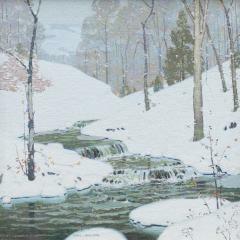 Oil on canvas showing a snow filled stream on a winters day in Vermont. 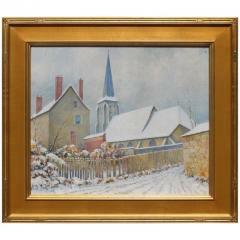 Oil on board of a snowy church yard in France. A superb example of Youngs work this painting depicts a group riders and hounds meeting before the hunt. The house has been identified as the home of Edward Everett Marshall who's family were avid fox hunters. 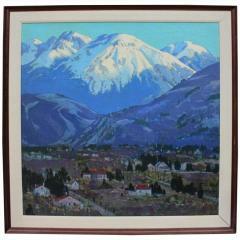 This painting still retains its original frame expertly carved and signed by Fredrick Harer. 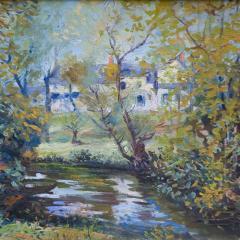 Oil on canvas of a landscape along a river. 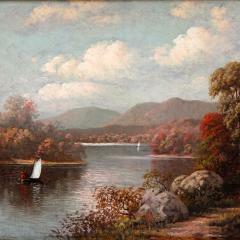 Two sailboats drifting down as the colors of fall start to show themselves on the trees. 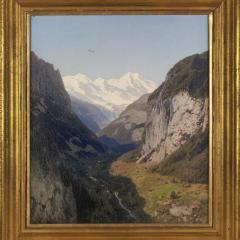 Oil on canvas of a stunning view of the Lauterbrunnen valley in the Canton of Bern, Switzerland. 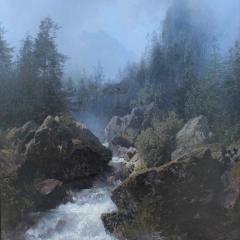 Oil on Board of white water rushing through large boulders of Reichenbach stream in the mountains of the Bernese Oberland region of Switzerland. This location was also popularly known as the place where Sherlock Holmes met his end in his final battle with Professor Moriarity. Falling to his death along one one the many waterfalls. 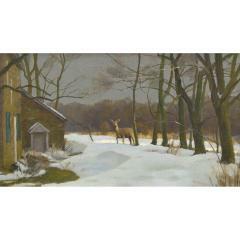 The capture of a moment set in a beautiful winter landscape, this painting demonstrates Leith-Ross' exceptional ability to not only put together compositions with considerable depth and light, but also create an ephermal moment with the inclusion of a single deer. It is initialed lower left. This idea started as one of my standard “vines-on-signs” pictures, but a sudden family crisis gave the subject new, more serious layers of meaning. Things came out all right in the end, but not all stories are meant for sharing. CLICK ON THE IMAGE OR TITLE TO READ ENTIRE DESCRIPTION FROM LIST VIEW. 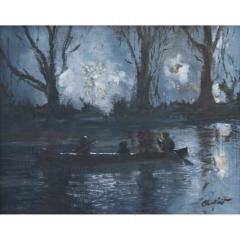 This painting really captures the dark air that fills its space – the eye has to strain a bit just as in real twilight. Some typical Hudson River School elements like the dramatic sky and dead tree are set against banal present-day objects at the edge of a parking lot. 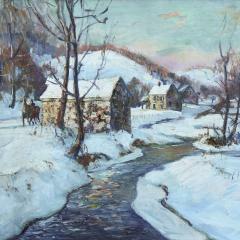 Oil on Canvas Entitled "Village in Winter"
A beautiful and bright winter landscape, this composition embodies many of the characteristics of Lawless' exceptional understanding of light and sky. 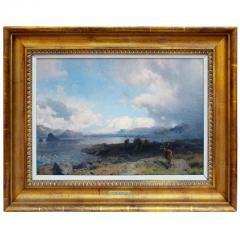 This charming painting still has it's original Newcomb Macklin carved frame. 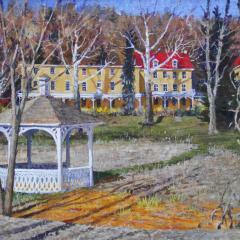 A vibrant rendering of Historic Yellow Springs in Chester Springs, PA. Yellow Springs holds a dear place in many artists hearts as it was the site for the Pennsylvania Academy of Fine Arts country school between 1916-1952. 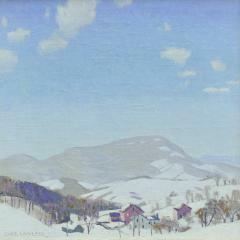 Here, Daniel Garber and other Academy professors worked with students seeking a notably different setting than Philadelphia for landscape painting. Signed lower left, Carl Lawless. 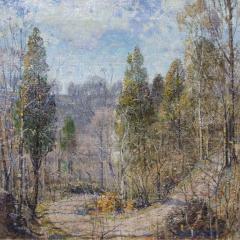 Titled on verso, "The Winding Road". 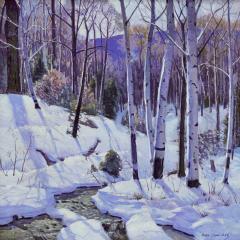 Vibrant forest landscape by Albert Van Nesse Greene. 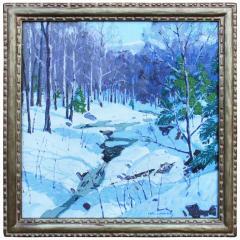 Beautiful landscape by noted New England artist Anthony Thieme. There is the beginning of a seascape painting on verso with estate stamp. 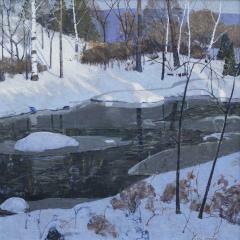 A large an engaging winter landscape by Carl Lawless. 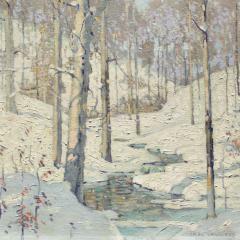 A somewhat transitional painting, Lawless merges an impresionist style with abstract compositional structure. 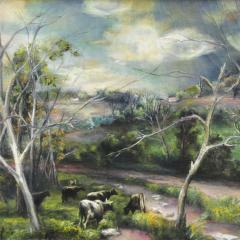 It creates a painting that carries your eye from foreground to background and right to left.